What is Dementia? Is it the Same as Alzheimer's? This is a question frequently asked. The terms dementia and Alzheimer's disease are frequently interchanged in the medical community and in written articles, so it is understandable that people would think they are the same thing. But they are not the same. Knowing what dementia is can be a helpful step in understanding this condition. 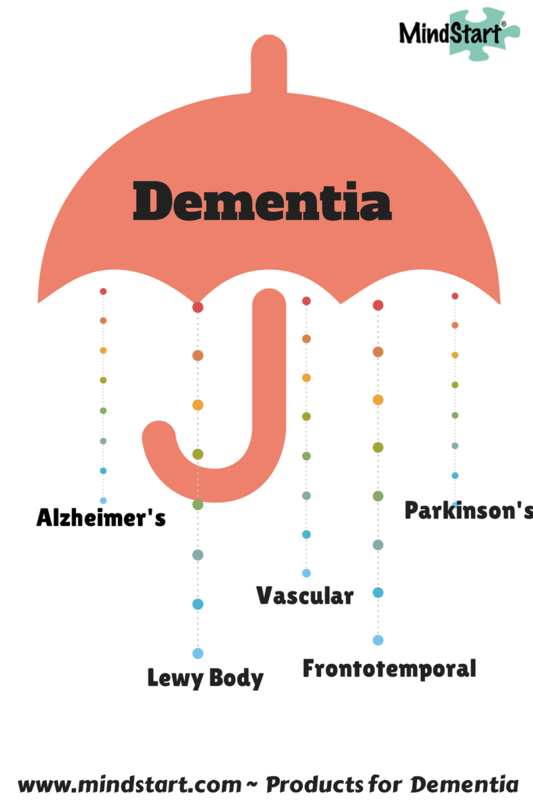 Dementia is an umbrella term, a general term covering many different diagnosis. In fact, there are over 75 types of dementia. The term dementia refers to a group of symptoms that affects functioning in everyday life. Symptoms can include include memory loss, impaired judgement, difficulties with language and attention, and personality changes. A complete neurological assessment can often define the type of dementia. Alzheimer's is the most common type of dementia, accounting for about 60% of cases. Other types of dementia include Lewy body dementia, frontotemporal dementia, dementia from Parkinson's disease and vascular (or stroke-related) dementia. Some types of dementia are reversible, such as a metabolic imbalance or a medication-related effect. It is helpful to know the type of dementia, as the symptoms and treatment can vary for the different types.For instance, patients with Lewy body dementia often experience visual hallucinations. Patients with frontotemporal dementia are often younger than those with Alzheimer's disease and often have significant changes in their personality and behavior. However, often there are common symptoms that are seen across many types of dementia, although how each person is affected will be unique. You may tell others that your loved one or friend has dementia, but to help increase awareness of the differences, go one step further and tell them what type of dementia the person has. Knowledge is power, so knowing the meaning and use of the term dementia can be helpful in your own understanding and when talking to others. thank you for sharing this information. My Twin Brother, who is only 52, and Retired from the Military is diagnosed with Dementia. Also He as a 20year Soldier has Many other diagnosis. Monica,I can't tell you how many times a client will say "my mother has dementia" when I question what's causing the dementia, they have no idea. The doctor said dementia and wrote out a prescription. I shake my head, how can the dementia be treated properly if there wasn't any further testing done to determine the cause of the dementia? And, Lorrie Staple, as a veteran, your brother may be entitled to financial benefits through the Veteran's Administration, benefits that would help pay for some of his medical expenses and dementia care. He (or you) should reach out to a Veteran's Service Officer at his local VA office. Have his DD214, aka discharge papers, available for the VS Officer to review. Thanks Lorrie and Wendy for the comments. Yes, Wendy, I have had that same scenario. I have also had patients that I treat in occupational therapy that have dementia listed as a diagnosis in the chart but family is unaware of that. I am guessing it is physicians who are afraid to have the conversation. I have learned to tread lightly when talking to family member of patients and learn what level of knowledge they are coming from before I speak. Need information on Alzeimhers in the U.K., and resources regarding care of patients available in Britain. Roxanne, glad you found our US based company! A wonderful, dementia care expert OT in the UK who can get your more local resources is Jackie Poole. She has a Dementia PAL program for caregivers. Visit her site at http://www.dementia-pal.com/about/about-dementia-pal/ to learn more. Great comment and first-hand advice. Thanks so much for sharing. Regardless of what causes it, or what you call it, or the type it is, DEMENTIA is really a collection of symptoms and a variety of deficits and a series of behavioral disorders. I hate labeling. These are problems in every day living, for a person stricken and even more so for his/her caregiver. First we must learn as much as we can about what we can do and what we cannot do for the sufferer. For example, don't try to change his/her mind, don't argue, accept him/her as he/she is right now. The paradox is "I am the same person, but I am different". A useful approach to this disorder is one that problem solves. Identify the problem, describe how it is a problem, review prior attempts to deal with it and don't repeat what didn't work. Learn to be creative. Join a support group and learn from others. Do not try to do this alone! I am a spousal caregiver. I have a mother who have dementia (sorry, I just couldn't resist :D ), but I actually do (think I) know what doused it. It started after her hip operation and anesthesia. Is is then a "medication" related dementia and is there anything I can do about it? Thank you in advance! I so appreciate, whenever I see efforts being made to educate caregivers, family, & friends of those who have dementia (one of the several/hundred's of thousand varieties). More family & caregivers need to be reached. More educational Seminars, Programs, Speakers. On education, there is still a huge gap, who aren't being reached. Perhaps "grants" need to be applied for FUNDING FOR EDUCATIONAL PRESENTATIONS. HANDS-ON ROLE-PLAY IN SEMINARS /STICK" SO MUCH MORE THAN READING PAMPHETS, BOOKS, OR BROCHURES. More needs to be done, and more, and better circulations of it, to do better to reach people, in this complicated Disease concept. GRANT FUNDING, perhaps is an answer financially, to move faster. DEMENTIA is like an Epidemic!! It's moving at a MUCH FASTER PACE, then what EDUCATION CAN KEEP UP!!! PLEASE CONSIDER FEDERAL FINANCIAL HELP THROUGH GRANTS, IF SO,---MORE GRANTS. EDUCATION IS FALLING "WAY BEHIND"!!! .L. O.